Simply said, for the first time make sure you choose something without intricate lacing, cables or fair isle patterns. The most important thing is to focus on the (approximately) right size and right construction of your garment. When you got that right, you can play around with more difficult details. 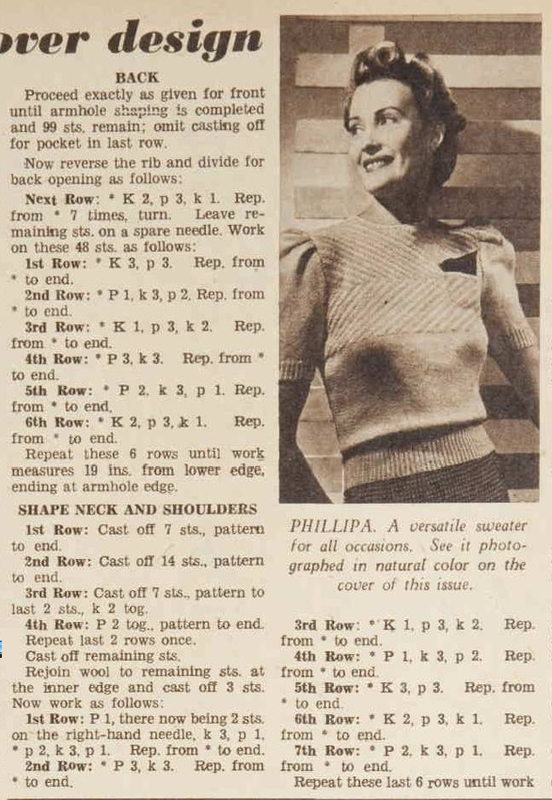 The patterned part of the 'Phillippa' is simple enough to knit, but still looks pretty. You could also choose a jumper with the bodice knitted in stocking stitch in combination with another simple yoke pattern. Read the pattern instructions at least twice and make notes. You really need to have an idea of how the garment is constructed. Take notes and make sure you don't miss anything, especially when your gauge is different or you need to resize a pattern. Pay attention to what the instructions exactly instruct you to do! For example: K2TOG each end of row or K2TOG at beginning of every row or K2TOG every alternate row makes a huge difference! I prefer visual information to written when it comes to knitting patterns, so for me it is much easier to use a stitch-count chart instead of counting the stitches all the time. A chart makes it also easier to spot mistakes and printing errors in the original pattern description! 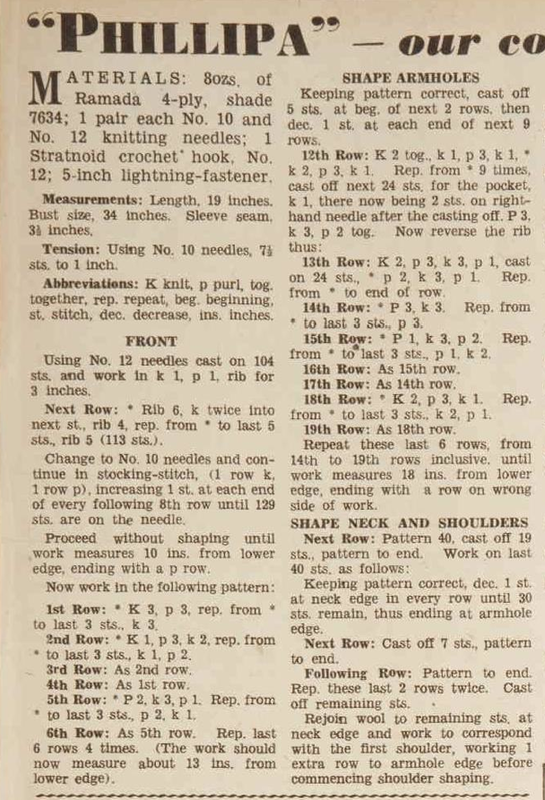 Note: a chart represents the right side of the pattern, so you should 'read' every other row backwards when not knitting on circular needles. 4. make a good swatch and wet block it! This to prevent putting a lot of time and effort in making a garment which will be unwearable after the first wash. To make it easier, you can start out with a sock-wool for the first time. These wools are generally superwash-treated to keep their shape and not to shrink or stretch after (machine) washing. It is important to keep your tension correct. After the few inches of the patterned part with K and P stitches my knitting became too loose. I had to rip it out and restart the patterned part on smaller needles. The reason was that when knitting in round I only used K stitches which made my work go fast but my tension became tighter too. Note: The tension or gauge swatch is usually for stocking stitch unless stated otherwise, for example if the garment is only knitted in pattern. While it is important to have the sizing as good as possible don't think calculating everything automatically results in the perfect fit. If you are not satisfied with your garment, the neckline or other details it is better to rip it out and start over. First when casting on the stitches and then to mark the sides or middle of the piece you are knitting. Re-count your stitches every now and then. The easiest way to do this is to place a stitchmarker every 10th or 20th stitch. If your count is correct you can remove them when knitting the next round. Make notes of your stitch counts, the amount of rows and other changes you make as you knit. If you have a good blueprint-pattern it will be so much easier to reproduce other patterns in your size too! Why would you do a different shaping of a standard armhole when one method works for you and you already figured it out? This is probaby the most important thing. When working on your first vintage pattern it is easy to get carried away by the pretty vintage pictures. I guess, the first one just can't be perfect, since you need to experiment with the ease and the fit, plus vintage patterns are usually shorter than we are used to. I think you should just enjoy knitting the garment and more important, learn and use the good things in your next project! - When working with a gauge of 7 sts to an inch you will have a size S/M) garment. - I casted on 84 sts for the sleeves instead of 80. - Feel free to add length! The 40's style jumpers are usually rather short.